INTRODUCTION: This report demonstrates the spectrum of central nervous system (CNS) abnormalities observed on MR imaging and CT studies in 6 patients with clinical or pathologic diagnoses of acute retinal necrosis (ARN) and retrobulbar optic neuritis (RBON-H) resulting from Herpes Zoster Virus and Cytomegalovirus. We discuss the etiologic and pathophysiologic implications regarding these findings. METHODS: Standard MR imaging sequences of the whole brain and selected high-resolution images of the orbits and globes, from 6 patients, were reviewed by three neuroradiologists for consensus interpretation of the findings. Special sequences augmenting disease were obtained in individual cases. Axial CT images were obtained from two patients using 5mm sequential slices. RESULTS: MR imaging findings showed both T2 signal brightening and contrast enhancement in one or both optic nerves, optic tracts and lateral geniculate bodies, as well as the postsynaptic optic radiations and optic cortex. Similar findings were observed in the superior colliculus, lateral midbrain and cerebellum, with multiple potential etiologic possibilities regarding pathways of dissemination. Low T2* signal (indicating magnetic field susceptibility effects) and CT hyperdensity, consistent with prior hemorrhage, were also observed in the optic tracts, optic radiations and lateral geniculate bodies. Post-contrast enhancement was observed in the meninges and Meckle’s cave in one HIV negative patient. CONCLUSION: These cases demonstrate CNS imaging findings associated with RBON that are temporally-related to ARN. They support the hypothesis that RBON can either precede or follow ARN and implicate transneuronal, transsynaptic and/or transcerebrospinal fluid viral spread by the herpetic family. Acute retinal necrosis (ARN) and retrobulbar optic neuritis of herpetic origin (RBON-H) are diseases usually seen in severely immunocompromised patients (with CD4 counts typically below 20%), such as those with HIV infection (1–4). In the immunocompromised population, members of the Herpesviridae family are usually found as etiologic agents. Most typically, the specific viruses are herpes zoster virus (HZV) or cytomegalovirus (CMV), but herpes simplex virus 1 is occasionally involved (5, 6). Both ARN and RBON-H secondary to these viruses are rapidly progressive in untreated patients, and they typically lead to blindness that can be bilateral (7–9). ARN attributable to HZV or CMV can often be distinguished clinically. HZV can produce progressive outer retinal necrosis (5, 10, 11), which is clinically distinguishable from the hemorrhagic retinitis produced by CMV (12–17). The different pathogens, however, may coexist (5). It has not been possible to distinguish CMV from HZV infections causing RBON-H.
On the basis of case reports and small series, some have hypothesized that ARN and RBON-H are etiologically related (7–9, 18–20). Some authors have proposed that ARN can spread in antegrade fashion to produce RBON-H (18, 19), while others have proposed that RBON-H might serve as a precursor to ARN (7, 8, 20). Furthermore, herpes ophthalmicus has preceded both ARN and RBON-H (7, 9, 21). CT scanning and MR imaging findings are rarely reported in the small clinical series presented to date. In reviewing the literature, we observed relatively few cases that described the imaging findings (22–24), with some cases reporting an absence of findings (7, 8). 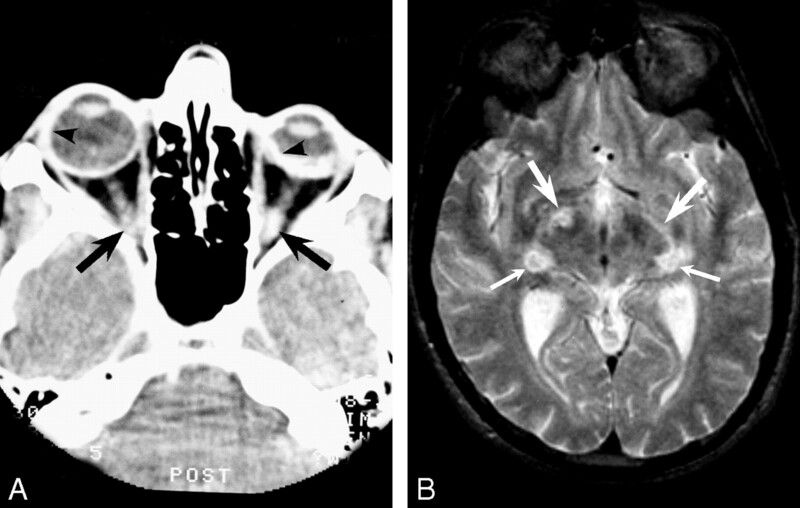 In this review, we describe a series of MR imaging and CT studies in six patients with clinical diagnoses of ARN and RBON-H associated with the Herpesviridae (HZV in four, HZV and CMV in two). In the cases involving HZV, three were established by unequivocal clinical findings. In one case, pathologic evidence of HZV infection was obtained on autopsy. The two cases of CMV retinitis were established clinically. We believe that the imaging findings in these cases have important implications on the etiology and pathophysiology of these disorders. Implications of the relationship between ARN and RBON-H, including possible trans-synaptic viral spread, are discussed. Three neuroradiologists (R.J.B., R.S., E.R.M.) reviewed standard MR images of the whole brain and selected high-resolution images of the orbits and globes from the six patients. Imaging with special sequences to augment pathologic analysis was performed in individual cases. In two patients, axial CT scans were obtained by using 5-mm sequential sections. Multiple sequences were performed in five patients by using one of two 1.5-T magnets (Philips Imaging Systems; GE Medical Systems, Milwaukee, WI). The following whole-brain sequences were applied in all patients: 1) nonenhanced and gadolinium-enhanced axial T1-weighted sequence (TR/TE = 400/40, in-plane resolution of 500 × 500 μm, number of patients [n] = 4); 2) axial T2-weighted, turbo spin-echo sequence (Philips Imaging Systems, 2000/200, n = 5) and sagittal T1-weighted spin-echo sequence (400/40, in-plane resolution of 500 × 500 μm, number of patients [n] = 3); 3) axial T2-weighted fluid-attenuated inversion recovery sequence (FLAIR, TR/TE/TI = 2000/200/180, n = 3); and 4) gadolinium-enhanced axial T2-weighted FLAIR sequence (2000/200/180 ms, n = 1). For all of these sequences, a matrix of 256 × 256, 5-mm section thickness, and 0.5-mm gap were used. Orbital or optic nerve high-resolution images were obtained in four patients by using the following: 1) nonenhanced and gadolinium-enhanced coronal and axial T1-weighted, turbo spin-echo sequence with chemical fat saturation (SPIR; Philips Imaging Systems [400/40, in-plane resolution of 250 × 250 μm, n = 3]); 2) axial high-resolution, T2-weighted FLAIR turbo spin-echo sequence with chemical fat saturation (SPIR; Philips Imaging Systems [400/40, in-plane resolution of 250 × 250 μm, n = 1]); and 3) sagittal spin-echo T2-weighted sequence (2000/200, 0.3-mm gap). For all of these sequences, a matrix of 256 × 256 and 3-mm section thickness were used. Axial CT scans were obtained in two patients by using 5-mm sequential scans throughout the brain (GE Medical Systems, 24-cm field of view, 130 kV, 175 mA, 525 mAs, half compensation). Pertinent clinical findings from the six cases are summarized in Table 1. Typical examples of the clinical course in a patient with HIV (case 3) and the clinical presentation from the one patient without immunodeficiency disease (case 6) in our series are presented. A 38-year-old homosexual white man was seropositive for HIV and presented with HZV infection in the T8 dermatome in June 1991. His medical history included a fracture of the cervical spine and shoulder dislocation but was otherwise unremarkable. His helper inducer T-lymphocyte (CD4) count at presentation was 80 (8%). Zidovudine was started for HIV treatment, and trimethoprim-sulfamethoxazole was given as prophylaxis for Pneumocystis carinii pneumonia (PCP). The patient’s CD4 count continued to decline, and didanosine was added to his treatment in June 1992. In May 1993, he developed Candida esophagitis, which was treated with fluconazole.In November 1993, he developed recurrent HZV infection in the T6 dermatome. At this time, his CD4 count had decreased to 5 (1%). Despite the HZV infection, acyclovir was not used. In November 1994, the patient developed a foreign-body sensation and photophobia in the left eye. Ophthalmologic examination revealed dendritiform lesions arising in the limbus, and his visual acuity was 20/20 in both eyes. Herpes simplex keratitis was diagnosed, and treatment was begun with topical acyclovir and steroids in both eyes. Findings from follow-up retinal examination were unremarkable for both eyes. A week later, examination revealed deterioration, with 20/300 visual acuity in the right eye and evidence of progressive outer retinal necrosis in both eyes, much more in the right eye than in the left. At this time, intravenous gancyclovir and acyclovir were started. Because the patient’s WBC count continued to decrease, an intraocular gancyclovir implant was placed in the left eye in mid-December. However, progressive outer retinal necrosis progressed further; therefore, intravenous foscarnet and open-label BV-AraU (Serivudine;Bristol-Myers-Squibb, New York, NY) were initiated. His condition slowly improved over the next 2 months. In March 1995, he presented with paresthesias of the left lower extremity, gait ataxia, and slurred speech. CT scanning and MR imaging (of partially limited quality) demonstrated an enhancing mass lesion in the posterior limb of the internal capsule. Toxoplasmosis was the presumed diagnosis, and sulfadiazine and pyrimethamine were initiated. Follow-up MR imaging revealed multiple areas of enhancement in the right internal capsule, thalamus, occipital cortex, and upper right side of the midbrain. Retinal examination showed no lesions owing to active progressive outer retinal necrosis at this time. CSF examination revealed one RBC, three lymphocytes, a protein level of 59 mg/dL, and a glucose level of 54 mg/dL. Blood, urine, and CSF cultures were negative. CNS lymphoma was suspected; thallium scans of the brain were negative. Foscarnet was discontinued, but BV-AraU and acyclovir were continued. At this time, biopsy was recommended but declined by family, and hospice care was begun. Treatment for the possibility of lymphoma was initiated with dexamethasone. However, because of the patient’s clinical deterioration, the steroid was discontinued 1 week later. Analysis of aspirated vitreous fluid was positive for HZV, and immunofluorescent staining at autopsy revealed HZV in the brain lesions. An 82-year-old woman was brought to a Boston-area hospital after 4 days of weakness and decreased oral intake. She described a rash on her left forehead, which started 2 weeks earlier, with associated periorbital and eyelid swelling but no paresthesias or dermatomal pain. She complained of a headache but denied neck stiffness, fever, chills, cough, chest pain, shortness of breath, and abdominal pain. She had been examined in an outpatient clinic 4 days before this presentation, and oral acyclovir had been started. Her medical history included subtotal thyroidectomy, multiple urinary tract infections, degenerative joint disease, a positive purified protein derivative result for tuberculosis (which was treated with isothioniazide in 1974), chronic obstructive pulmonary disease, left bundle branch block, anemia, and anxiety. Her usual medication regimen consisted of alendronate sodium, ibuprofen, senna (Senokot; Purdue Pharma L.P., Stamford, CT), triamterene (Dyazide; SmithKline Beecham, Philadelphia, PA) and polysaccharide-iron complex (Niferex; Thera-Rx Corp., St. Louis, MO). Her routine admitting examination revealed the following: blood pressure of 149/80 mm Hg, heart rate of 84 beats per minute, oral temperature of 74.8°F, clear lungs, extra S4 heart sounds and systolic ejection murmur with an increased point of maximum impulse, and normal abdominal findings. Skin lesions were noted in the fifth cranial nerve (V1–V2) area; these were crusted and golden-brown in color. Associated swelling of the left eyelid was observed. Neurologic examination showed normal cranial nerves V–XII, decreased alertness, and an unsteady gait. Ophthalmic examination showed enlarged pupils that were minimally reactive, and slitlamp examination showed conductive iritis with pseudodendrites but no uveitis or retinitis. Laboratory workup indicated a WBC count of 4.6 k/μl, a hematocrit value of 36%, a platelet count of 165 k/μl, an international normalized ratio of 1.2, and normal electrolyte and glucose levels. The chest radiograph and electrocardiogram obtained on admission showed clear lungs and a left bundle branch block, respectively. On admission, the patient’s treatment with oral acyclovir was continued, and neurotonin was started to treat herpetic neuralgia. Throughout the first day of her admission, the patient’s mental status waxed and waned. This was initially attributed to an underlying mild dementia exacerbated by her hospitalization, which had placed the patient in an unfamiliar environment. During this first day, oral acyclovir was changed to an intravenous dose of 7.5 mg/kg. Topical erythromycin ointment was added to her skincare regimen to prevent superinfection. Despite this initial management, the patient’s mental status continued to decline, with increased confusion and visual hallucinations noted over the next 24–48 hours. Additional laboratory tests were performed to check her vitamin B12, thyroid stimulating hormone, and rapid plasma reagent (RPR) levels; all were normal. After her mental status continued to decline, herpes encephalitis was suspected and MR imaging was ordered. T1-weighted images showed contrast enhancement of the Meckle cave with associated faint enhancement of the pons, midbrain, optic chiasm, and tentorium cerebelli. Inversion recovery images showed faintly increased T2 signal intensity in the same tissues. Contrast enhancement was more clearly demonstrated on contrast-enhanced T2-weighted FLAIR images and on T1-weighted images with a magnetization transfer pulse applied. The findings were reported as being consistent with CNS spread of HZV ophthalmicus. Lumbar tap was performed and showed: 489 WBCs (31% polymorpholeukocytes), 21 mononuclear cells, and elevated protein and normal glucose levels. Results of polymerized chain reaction (PCR) testing for varicella-zoster virus were positive. The patient’s clinical course consisted of continued mental status decline during the third day; this was attributed to an aspiration pneumonia, as demonstrated by bilateral infiltrates on follow-up chest radiographs, decreased oxygen saturation, and a newly elevated WBC count. Intravenous antibiotics (ceftriaxone and clindamycin) were started, with eventual improvement. Her recovery was further complicated by the development of syndrome of inappropriate antidiuretic hormone (SIADH) secretion, as diagnosed on the basis of a depressed serum sodium level (119 mg/dL) with an elevated urine sodium level (120 mg/dL). SIADH was attributed to the HZV meningocerebritis. Water restriction and diuresis with lasix was started, with subsequent slow improvement. The patient’s status continued to improve, and she was discharged home in October 1999 with cepodoxime and Flagyl (metronidazole; Rhodia, Cranbury, NJ) after completing the course of intravenous acyclovir. Figures 1–5 show the imaging findings from five of the six cases. One case was omitted because the findings were repetitive of those of the other cases. Table 2 summarizes the findings. Images from 1988 obtained in a patient with AIDS with CMV-induced ARN preceding retrobulbar optic neuritis. A, CT scan shows a shrunken left globe with bilateral avidly enhancing sclera (arrowheads) and enhancement of both optic nerves (arrows). B, T2-weighted image shows increased signal intensity in the optic tracts (top arrows) and geniculate bodies (bottom arrows). CT examinations were performed in four of the six patients. On nonenhanced CT scans, hypoattenuating changes occurred along the optic tracts in two of the four patients (patients 3 and 6). These two patients had diagnoses of HZV, one of which was established clinically and the other, pathologically. Hyperattenuation was seen along the optic tracts of another patient, patient 2. Contrast-enhanced CT series were obtained for a single patient (patient 1) and enhancement was seen in both optic nerves, both retinas, and both sclerae (Fig 1). 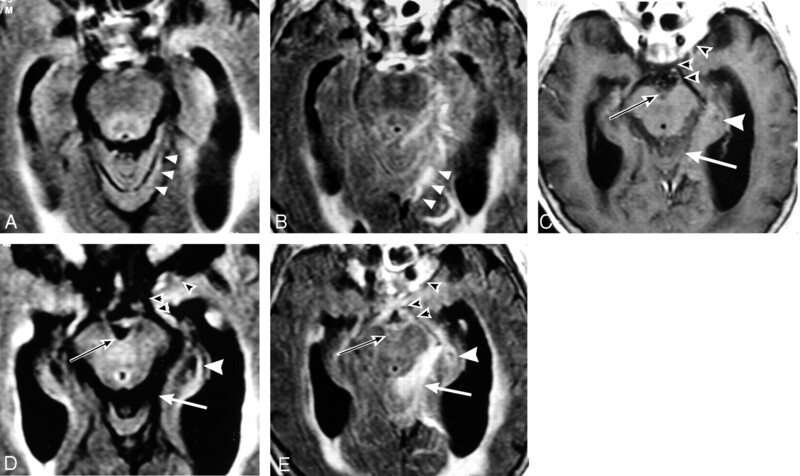 These hyperattenuating lesions accompanied mixed low and high signal intensity in the optic tracts and geniculate bodies on a T2-weighted MR image in the same patient (Fig 1). The destruction induced by the infection led to a shrunken left globe (phthisis bulbi), which was also seen in two additional patients (patients 2 and 5). MR imaging was performed in all six patients. Relative increased T2 signal intensity in the optic pathway was the most consistent finding; this was observed in all patients from whom MR images were available (Figs 1–5). The following structures showed increased T2 signal intensity (Table 2): optic nerves (patients 1, 2, 4–6), optic chiasm (patients 2, 4, 5) optic tracts (patients 1, 2, 4, 5), lateral geniculate bodies (patients 1, 3), optic radiations (patient 3), visual cortex (patient 3), midbrain structures (patients 3, 6), trigeminal nerves (patients 3, 6), and meninges (patient 6). Although T2-weighted FLAIR images were obtained in three patients (patients 4–6), meningeal changes were visible on FLAIR images in only a single study (patient 6). Increased T2 signal intensity in the optic tracts and optic radiations were most conspicuous on the heavily T2-weighted images, whereas the FLAIR images better demonstrated changes in the optic nerves, meninges, and optic chiasm. Decreased T2* signal intensity in the optic pathway was seen in two cases (patients 2, 3) (Figs 2 and 3). Lesions with these findings occurred in the optic tracts both unilaterally (patient 3) and bilaterally (patient 2). Similar lesions occurred in one optic nerve (patient 3). Overlapping diagnoses of CMV and HZV infection were made in patient 2, while immunofluorescent labeling confirmed HZV infection in patient 3. The findings were thought to represent hemorrhage or mineralization or both. MR images obtained in patient 2. A, T2-weighted coronal image shows both increased (left) and decreased (right) signal in the optic tracks (arrows). B, Contrast-enhanced T1-weighted image shows enhancement of the left optic nerve and low signal intensity in the right optic nerve (arrows). C and D, Contrast-enhanced T1-weighted images show enhancement of the right optic tract (arrow in C) and chiasm (arrowhead in D). Images obtained in patient 3 with HZV-induced progressive outer retinal necrosis preceding retrobulbar optic neuritis, CNS extension, and eventual demise. 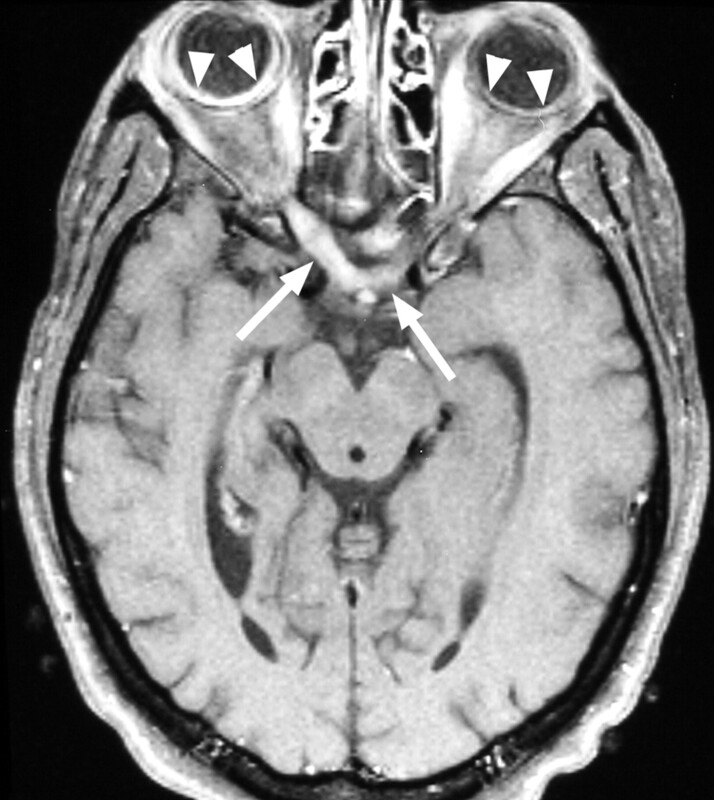 A, Coronal T2-weighted gradient-echo image suggests hemorrhage in the right lateral geniculate body, with increased signal intensity involving the optic radiation through the temporal lobe (arrowhead) and extending caudad along the lateral midbrain (large arrow) to the cerebellum (small arrow). B, Axial T2-weighted turbo spin-echo image shows increased signal intensity along the right optic tract (white arrow) and lateral geniculate body (black arrow). C and D, Proton density–weighted images demonstrate abnormally high signal intensity along the right hemipons (thin arrow in C), right midbrain, and superior colliculus (arrow in D), occipital (visual) cortex (thick arrow in C), and optic radiation in the temporal lobe (arrowheads in D). E, T1-weighted contrast-enhanced image shows enhancement in similar regions: optic tract (white arrow) and lateral geniculate body (black arrow). Postmortem immunofluorescence stains (not shown) demonstrated HZV in these areas. Contrast enhancement along the visual pathway and meninges was observed on MR images obtained in patients 2–6 (Table 2, Figs 2–5). Contrast-enhanced images were not obtained for patient 1. In studies in which contrast material was administered, enhancement was seen on T1-weighted images in the optic nerve and optic chiasm (patients 2, 4–6); optic tracts (patients 2–6); optic radiation (patient 3); and semilunar ganglion–Meckle cave, midbrain, and meninges (patients 3, 6). HSV was clinically diagnosed in these five patients, although two (patients 2, 3) had an overlapping diagnosis of CMV retinitis post-contrast. Patient 4 with HZV-induced progressive outer retinal necrosis and retrobulbar optic neuritis after herpes ophthalmicus. T1-weighted contrast-enhanced image shows enhancement of the optic nerves (right distal, left proximal) and optic chiasm (arrows). Compare the thickened, avidly enhancing right chorioretina with the normally enhancing left retina (arrowheads). Axial images obtained in elderly HIV-negative woman with HZV ophthalmicus preceding retrobulbar optic neuritis and mental status changes. A and B, Nonenhanced and enhanced T2-weighted FLAIR images at the level of the pons show minimal abnormal high signal intensity in A and avid enhancement in B in the left ambient cistern, supracerebellar cistern, cerebellar vermis and adjacent subarachnoid space along the tentorium (arrowheads). C–E, Axial images at the level of the midbrain. Contrast-enhanced conventional T1-weighted image in C shows minimal enhancement. Nonenhanced (D) and enhanced (E) T2-weighted FLAIR images show avid enhancement of the optic nerves, chiasm, tracts, and pericavernous region (black arrowheads), right lateral geniculate body (white arrowhead), interpeduncular cistern (black arrow), and supracerebellar cistern (white arrow). Standard T1-weighted, magnetization-transfer T1-weighted images, and T2-weighted FLAIR images were obtained in a single patient (patient 6, Fig 5). Conspicuity of the enhancement appeared to be most evident with the contrast-enhanced T2-weighted FLAIR sequence. Follow-up MR studies were obtained in four patients (patients 2, 4–6). 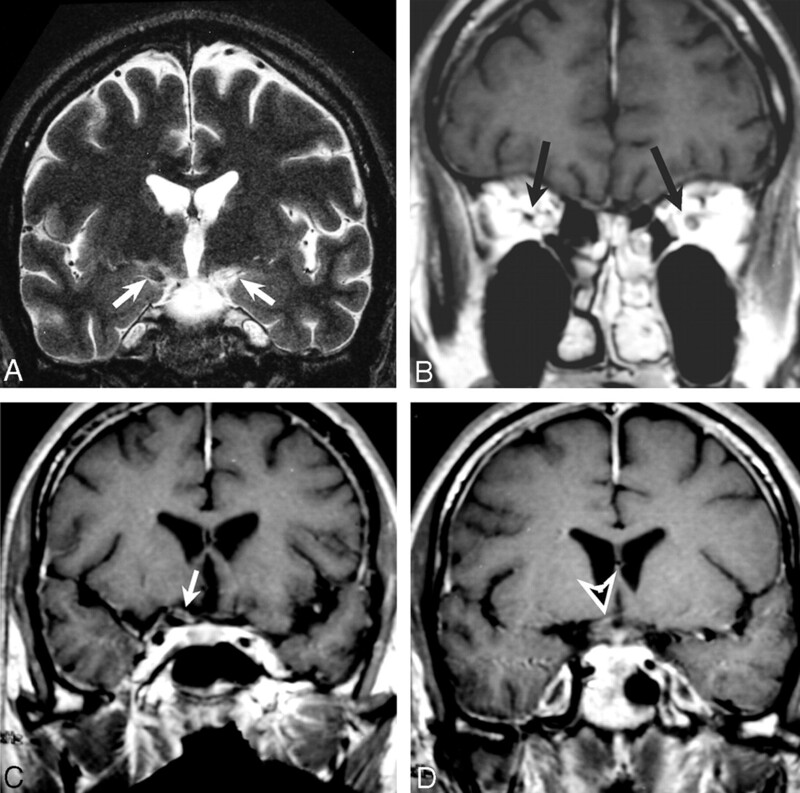 These images showed atrophy or encephalomalacia in all four cases, regardless of treatment. 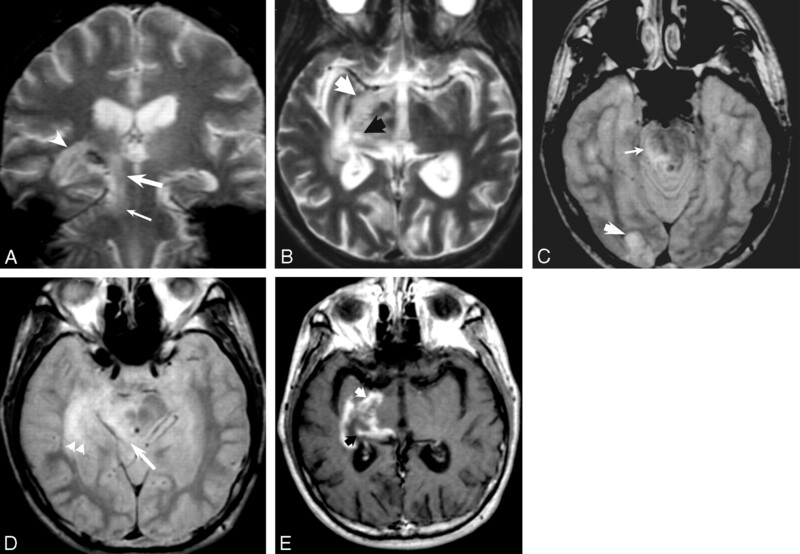 In this review, we showed images from six patients with clinical or pathologic diagnoses of CNS involvement associated with either HZV or CMV. Clinical diagnoses were established on the basis of characteristic ophthalmoscopic findings, vitreous aspirate results, or classically associated skin lesions. We believe the CT scanning and MR imaging changes represent areas of viral infection and associated inflammation. In one case, this hypothesis was confirmed at autopsy. In the other cases, both symptom onset and post-treatment improvement was correlated with the changes in MR imaging signal intensity. Table 2 summarizes the results observed on the CT scanning and MR imaging studies, showing the spectrum of imaging findings that we observed. Imaging findings were seen throughout the visual pathways, including the superior colliculi. Involvement of the meninges, midbrain, and cerebellum were also observed in two cases. We believe that our findings are consistent with the first two of three possible hypotheses that have been proposed for the dissemination of herpes viruses from the globe or ophthalmic division of the trigeminal nerve to the CNS (28): 1) transneuronal spread from the retina with antegrade, retrograde, and trans-synaptic spread to other visual structures; 2) transneuronal spread from the trigeminal ganglia to its innervations of the meninges, followed by CSF spread to other structures; and 3) transneuronal spread to the vessels of the CNS innervated by the trigeminal nerve, with resulting vasculitis. Transneuronal and trans-synaptic spread of HSV and other viruses to the CNS has been demonstrated in animal models (25–27). Furthermore, imaging studies have shown associated CNS lesions in cases of peripheral HZV infection of the ear (Ramsey-Hunt syndrome) (29), in cervical dermatomes (spinal cord) (30), and in trigeminal nerve dermatomes (spinal trigeminal nucleus and tract) (31). Some have also proposed that CNS lesions result from vascular infarcts produced by herpetic spread into vessels innervated by the trigeminal nerve (22–24, 32, 33). Trigeminal projections to the superior cerebellar artery, basilar artery, and other vessels in the circle of Willis have been shown to exist in animals (34). Resulting vasculitis with infarctions have been postulated to produce the MR imaging–detectable lesions reported in these cases. Herpes viruses might conceivably disseminate through the CNS from the trigeminal nerve via trigeminal innervation of the meninges, with resultant CSF spread. HSV has been associated with viral meningitis and meningoencephalitis (35). HZV and HSV isolates have been detected in the CSF by means of immunoassay when remote dermatomal occurrence of infections have coincided with radiculopathy in the lumbar spine (30, 31, 36). However, animal studies testing this mode of spread were not found in the online literature. In the four cases of HZV in our series, optic neuritis followed corneal disease by varying time intervals. In two cases, imaging findings could be traced to the lateral geniculate bodies. In one of these, the optic radiations and optic cortex were also involved. To spread from the optic tract to the optic radiation, the virus must cross the lateral geniculate synapses. One of three possible mechanisms can explain these phenomena: 1) the virus spreads trans-synaptically in these cases, 2) the virus spreads to the postganglionic neurons via the CSF or via the microvasculature, or 3) the virus “jumps” the synapses. Our series is most consistent with transneuronal–trans-synaptic spread of HZV in most cases. However, some of our images are at least partially consistent with local meningeal spread via the CSF or microvasculature. Meningeal enhancement, including the involvement of the Meckle cave (patient 2, Fig 2; patient 6, Fig 5) and viral spread to the lateral brain stem (patient 3, Fig 3; patient 6, Fig 5), were observed. Furthermore, increased T2 signal intensity in the adjacent CSF was also observed on FLAIR images obtained in patient 6 (Fig 5). Other findings, however, are difficult to explain with the meningeal–CSF mode of transmission. Contrast enhancement and increased T2 signal intensity were also seen in deep white matter and gray matter structures, which were remote from the CSF space in multiple cases. Furthermore, the pattern of spread was more closely related to the neuronal pathways than the vascular supply for most findings. The pattern of spread was conspicuously related to the visual pathways in most images, rather than the formation of a more geographic infection, as typically seen in bacterial infections and non–neuronally spread viral infections, such as progressive multifocal leukoencephalopathy. Additionally, autopsy results were available in one case and demonstrated zoster virus in the neuronal tissue. These findings support transneuronal spread of the virus, which is not surprising, given the accumulation of animal model and clinical data supporting this means of viral dissemination. Further consideration can be given to the possibility of trans-synaptic spread. In patient 3 (Fig 3), the affected areas involved extensive regions remote from the initial site of infection and often involved tissues geographically related to the primary path of spread. It is reasonable to propose that the virus spread to these adjacent tissues through the interstitial tissues. If the virus can spread locally through the interstitium, there is little to prevent local trans-synaptic spread; the virus might then be further disseminated along axons in either antegrade or retrograde fashion. Gliosis related to wallerian degeneration due to diseased retinal ganglion cells might conceivably account for the increased T2 signal intensity and atrophy that was correlated with the neuronal pathways. However, this possibility would not explain the contrast enhancement also observed at many of the same sites. Furthermore, increased signal intensity on nonenhanced T1-weighted images and high attenuation on CT scans were seen in some cases. These changes are typically secondary to hemorrhage or the deposition of divalent cations in association with inflammation or hemorrhage. Our series clearly demonstrated imaging findings that indicate central inflammatory changes associated with ARN; these observations support the association of RBON-H with ARN. Our findings generally support CNS, as well as PNS, transneuronal and trans-synaptic spread of the HZV and CMV in both immunodeficient patients and immunocompetent patients. Dissemination via CSF might also be contributory. Although local petechial hemorrhage and small-vessel vasculitis may contribute to the pathogenesis of the disease, our findings were poorly correlated with vasculitis and stroke involving the circle of Willis and other intermediate vessels, as other have proposed (32–34). The reported occurrence of RBON-H before ARN, together with our findings, could indicate a pathway in which HZV or CMV are transmitted first centrally (via fifth-nerve projections to the CNS vasculature or meninges) then peripherally to the retina (via the second nerve). We also observed inflammatory changes involving the superior colliculus, where the oculomotor nerves, fifth nerves and second nerves have synapses. This provides another pathway from the fifth to the second nerves, as well as a pathway to the extraocular muscles (via the third, fourth, and sixth nerves) from the sensory system. These interlinking connections have the potential to spread infection from the trigeminal ganglia to the extraocular muscles, sclera, and retina. Accepted after revision January 28, 2004.